Day by day the technology is taking a step forward in printing standards of woven polypropylene bags. We offer the latest technology in printing of Woven Polypropylene Bags (WPP Bags). This process is a bit different from the Flexographic printing in which the desired image/words were being transferred directly onto the WPP rolls / bags / fabric; where as in this process a thin film of BOPP is passed through Gravure process to obtain the sharp and accurate image and then laminated onto the WPP Bag. It can be produced in glossy and matt finishes; amongst which mostly demanded is glossy finish. STP produces the fabric in a tubular form where the film is laminated to the fabric on both sides / single side according to requirement. Related artwork is prepared in particular computer applications by the experienced designers in which any type of photographic image can also be printed; which gives a characteristic look which enhances packaging experience; when compared to the normal WPP bags. Our Design, Manufacturing & Service team has in-depth knowledge and expertise with this product used for grains, pulses, corn, feeds to name a few and is able to advise the best ways to maximize the packaging effect. We offer 100% custom designed BOPP Laminated Polypropylene woven bags / sacks as per the desired specifications. 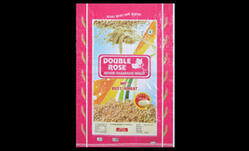 Usage: Packing Grains, Corn, Seeds, Rice, Sugar, Flour etc. • Plain or gusset, Top open or valve, bottom single or double fold stitched (Can be produced in many different sizes). Sellers of plain polythene bags, flexo printed polythene bags, plastic bags, plain plastic bags, pritned plastic bags, plain paper bags, printed paper bags, etc.